The summer in Delhi is no joke, if there is one thing that you cannot leave house without , an absolute summer must have is Sunglasses. So where it's more or less a necessary and something that's going to sit on your face all day long,it has to be the best and of latest trend. So here are 6 different styles of sunglasses from Sunglassesdelhi that are perfect for every face shape. 1) Aviator Sunglasses: This is my all time fav shape, it looks cool all year round and literally never goes out of trend. My fab ones are Rayban Avaitors. 2) Oval Sunglasses: This is one of the most common sunglasses shapes, it looks good on all face cuts. So if you want to play it safe then just get a pair of oval sunglasses. 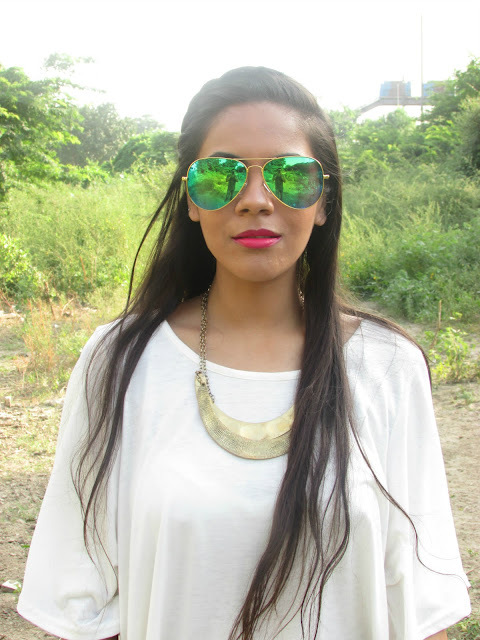 3) Rectangle Sunglasses: This is one shape that looks really classy and will go well with all styles of clothes. 4) Cat Eye Sunglasses : Now that's my current obsession, cat eye sunglasses. It looks chic and will immediately make you feel upbeat. 5) Round Sunglasses : Vintage looks are so popular these days and the key to it are round sunglasses. It has that retro vibe and will transform your look completely. 6) Wayfarer Sunglasses : Now to the most professional and classy looking sunglasses. If you are somebody who does not want the casual look by adding sunglasses, wayfarer sunglasses is what you need. All these sunglasses shapes have made it possible for everyone to get one according to his own style. These are the latest sunglasses styles, just pop onn the one you like and have a stylish and safe summer. That is so exciting! Congrats! Love this beachy white outfit! Beautiful dress great combination love the handbag as well great job doll. Have a great weekend.